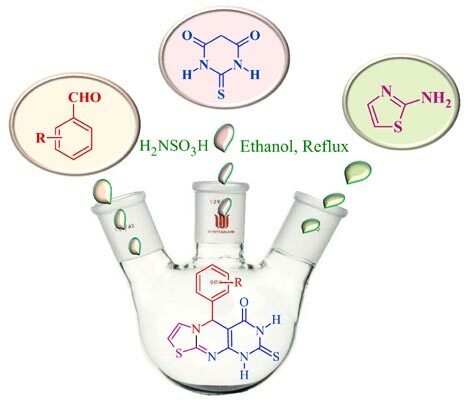 Background: A straightforward protocol for the one-pot synthesis of a series of novel thiazolopyrimidine derivatives has been developed. Method: In which multicomponent reaction between thiobarbituric acid, 2-aminothiozole and several substituted aldehydes using sulfamic acid (20 mol%) as a heterogeneous and easily recoverable catalyst in ethanol under reflux condition. Conclusion: This method has several advantages like greener synthetic approach, good to excellent yield (82-91%), cost-effectiveness, easy work-up and atom-economic procedure. Keywords: 2-Aminothiazole, 2-thiobarbituric acid, thiazolopyrimidine derivatives, sulfamic acid, atom economy, multicomponent reaction. Affiliation:Department of Agrochemicals and Pest Management, Shivaji University, Kolhapur, M.S., Department of Chemistry, Shivaji University, Kolhapur, M.S., Department of Agrochemicals and Pest Management, Shivaji University, Kolhapur, M.S., Department of Agrochemicals and Pest Management, Shivaji University, Kolhapur, M.S., Department of Agrochemicals and Pest Management, Shivaji University, Kolhapur, M.S., Department of Chemistry, Shivaji University, Kolhapur, M.S., Department of Agrochemicals and Pest Management, Shivaji University, Kolhapur, M.S. Keywords:2-Aminothiazole, 2-thiobarbituric acid, thiazolopyrimidine derivatives, sulfamic acid, atom economy, multicomponent reaction. Abstract:Background: A straightforward protocol for the one-pot synthesis of a series of novel thiazolopyrimidine derivatives has been developed.